When finding B2B leads, it’s a good idea to work with a variety of methods. You’ll be more likely to catch decision-makers when they are fresh and willing to give offers a fair hearing. Plus, you can uncover methods ideal for your business. Quora is an emerging thought leadership platform where contributors can provide expert advice in response to other users’ questions. Although it’s showing some signs of becoming crowded, it has struck a good balance in giving genuine thought leaders a place to interact and connect. Quizzes can be an enjoyable way to inspire interaction with your website. With an interesting and informative quiz, prospects have the opportunity to gain new perspective on their situation – while qualifying themselves on your products. Plus, well-designed quizzes are eminently shareable. Retargeting can smoothly reintroduce users into your sales funnel if they have bounced from your site in the past. The ads triggered by your retargeting pixel can be highly specific – related to content users perused or purchases they thought about making – which gives them a personal feel. Live chat (with real people, not bots) can have a tremendous impact on your website’s results. It helps your prospects find the information they need instantly without having to look for it. In a world where convenience always counts, this little gesture can make a big difference. Sales pros and prospects alike have abandoned cold calling in droves. A traditional cold call can be interruptive and manipulative. Identify a genuine connection with your prospect, however, and you can move on to “warm calling” while using a lower volume of calls to your advantage. B2B decision-makers have steadily consumed more and more videos over the last five years. When you produce helpful and informative videos, you capture organic traffic while giving your prospects the sense that they already know your brad better than your competitors. Many B2B businesses get so focused on advising others on what to do that they never share what has worked for them. Talking about your own challenges and changes can be both refreshing and humble. In the right format – email series, whitepaper, or infographic – this is engaging content. 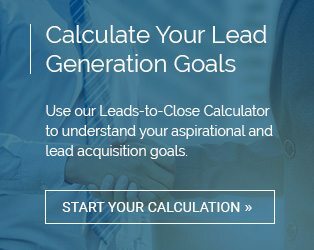 There’s no end to lead generation opportunities in B2B. While tried-and-true methods should be in your repertoire, don’t be afraid to embrace creativity and buck trends. You can win big simply by being where few others in your industry go.